Living with Thai cooking teacher Kasma Loha-unchit and traveling all over Thailand together, I have been exposed to a very large number of Thai dishes. I am often asked by students which are my favorites. Talk about a difficult choice! There are dozens of dishes that I could put on such a list: I sometimes joke that my top 10 list has 30 dishes on it. If forced to pick, though there are 5 dishes that would most likely always make the cut. These are those 5 dishes. By the way, Kasma estimates that what you see on menus in Thai restaurants here in the United States represents perhaps 5% of the total number of dishes: unless you travel to Thailand and eat adventurously (or take Kasma’s Advanced Thai cooking classes), you’ll miss out on the incredible variety offered by Thai Cuisine. Although pride of place at the top of the list goes to Spicy Basil Pork, I’m not actually going to say very much about this dish because I’ve already written a blog on it: Basil Pork – Moo Pad Kaprao. 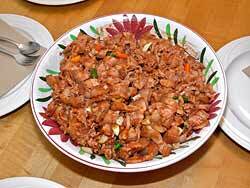 It suffices to say that this is the one of the most popular dishes in Thailand. You can make almost anything pad kaprao – stir-fried with basil. 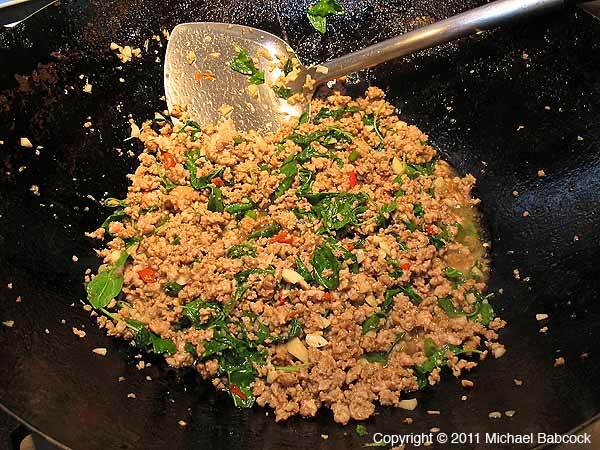 My favorite of all the versions is when it is made with ground pork, holy basil (kaprao) and lots of fiery hot Thai red chilies. It is best if the ground pork is not too lean. In Thailand when you ask if someone has eaten, you literally ask them if they have eaten rice. This dish is a perfect illustration of a dish that tastes so much better when it is eaten with rice. It’s good with jasmine rice, and it’s also good with brown rice, GABA Rice, or a combination of both. People often think of Thai cooking as being very labor intensive. This is one dish that, once you’ve made it a few times, can be put together very quickly. Try cooking it yourself by adapting Kasma’s online recipe for Spicy Basil Chicken. 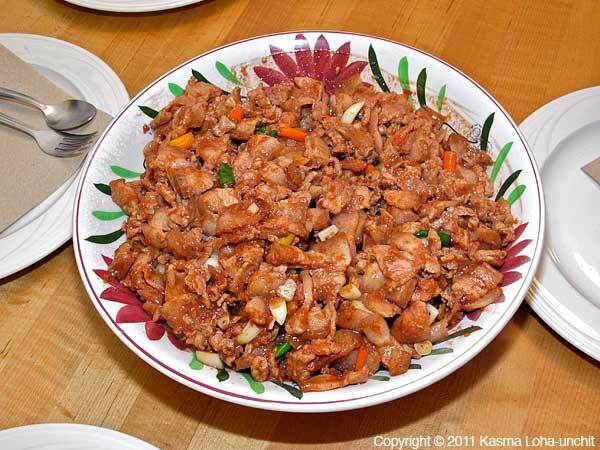 When I first met Kasma, I never would have eaten this dish. My loss. I first had the dish at Ruen Mai restaurant in Krabi. For me, this dish is like a beautiful dance between the pork belly and the fermented tofu. It’s a very difficult dish to describe to someone who has never had fermented tofu, which can be an acquired taste. The first time I ate it, I had a hard with its unaccustomed smell and taste. Somewhere along the line, though, I came to love it. The combination of the pork belly, garlic, Thai chilies along with a bit of fish sauce, red brine from the fermented tofu and a bit of sugar to balance flavors produces a stunning dish: it has a very rich mouth feel from the fatty pork and the fermented tofu gives it a sourness along with something very nearly indescribable. This is one of my very favorite dishes of all time. I’m showing two versions here: to the left above is the version from Ruen Mai restaurant in Krabi. The second version directly to the right (click to see a larger version) is from Kasma’s Advanced Set H cooking series. Both versions are good. Kasma’s is a bit moister and just a little bit different in flavor. I would eat either one in a heartbeat. 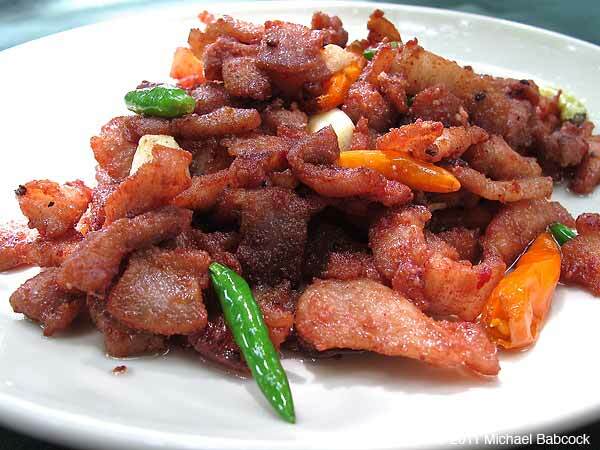 This dish, like the Spicy Basil Pork above, does need chillies in it. One of the wonders of Thai cuisine is the melding of the 4 or 5 different flavor groups (spicy/hot, sour, sweet, salty, bitter) into a harmonious whole. However, if you remove just one of the flavor types, the whole harmony falls apart: to enjoy Thai food you really must learn to enjoy a certain amount of heat, at least for many of the dishes. If you try to make it yourself at home, make sure you get the red fermented tofu rather than the paler variety. There is a growing body of evidence that most forms of soy are not very healthy for you. Unfermented soy contains phytates which prevent many of the minerals from being absorbed by your body. Soy also contains substances that depress your thyroid activity. (To name only two of the undesirable qualities.) It’s ok to eat fermented soy products (such as miso, naturally made soy sauce and fermented tofu) because the fermentation process alleviates nearly all of the ill effects. I invite you to go to visit Soy Alert for a summary of many of the undesirable effects of soy and links to 70 different articles about its dangers. A good article to begin with is The Ploy Of Soy . Bitter melon is an ingredient that is foreign to many Westerners, although it is very widely used in both Asian and Indian cuisines. You may want to read Kasma’s article: Bitter Melon – Mara to learn more about this interesting and very healthy vegetable. I liked bitter melon the first time I tasted it, when Kasma cooked this dish. It is, as you might suspect, a bit bitter in taste; the darker green the vegetable the more the bitter flavor. This is a very simple dish: stir-fry the sliced bitter melon in a bit of fat (I prefer duck fat or lard) until it begins to turn a bit transparent; then add whisked eggs and cook until the egg is set and done; fish sauce is added, to taste, along the way. That’s pretty much it. The result is a pleasantly bitter dish, with a little bit of salty fish sauce flavor combined with the egg. Served over rice, it’s a perfect one dish meal: you get your vegetable, your protein, your starch. Kasma teaches this dish in her Beginning/Intermediate Intensive and it is also available in Thailand. You can try this dish for yourself: Kasma’s recipe for Bitter Melon & Egg is available on our website. You may want to start out with a bitter melon that is slightly lighter in color and, therefore, less bitter. For years one dish that never leaves this list is the Roasted Eggplant Salad. When I think of this salad I think of two versions, Kasma’s and the version from My Choice restaurant in Bangkok. I’ve included pictures of both versions here. The leftmost picture is Kasma’s version from her Advanced Class, Set A. The picture to the right shows the dish as it was served at My Choice. 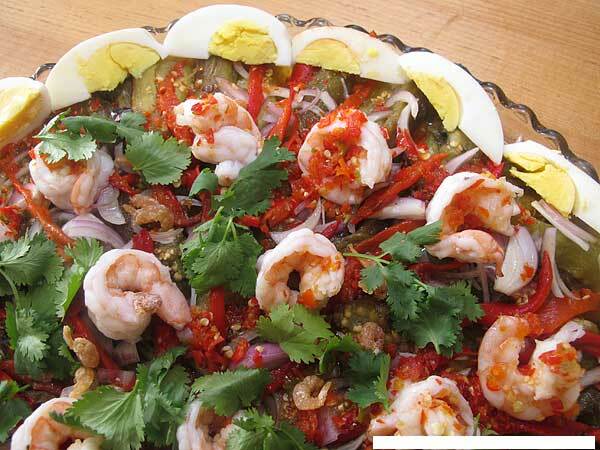 I prefer Kasma’s version, which includes small dried shrimp and hard-boiled egg, which give the salad added texture and dimension. There are several things that make this dish delicious. 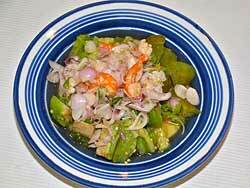 The first is the dressing, which is spicy/hot and sour, with a touch of sweet. The second is a combination of textures, from the soft roasted eggplant, the raw shallots, the shrimp, and, in Kasma’s version, dried shrimp and hard-boiled egg. The third factor comes from the grilled eggplants. 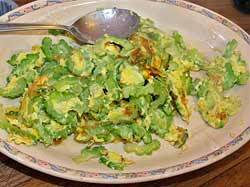 Many years ago a student of Kasma’s signed up to bring this dish to a potluck. I immediately began salivating. When he brought the dish I was really disappointed because he had broiled the eggplant, not grilled them. The grilling adds an absolutely essential dimension to the dish. Without the grilling, it’s just another salad. It should be grilled with natural charcoal, such as mesquite, or flavoring chips (such as mesquite) should be added to the coals. There is one way in which the My Choice version is superior: the eggplant itself. 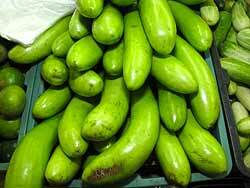 In Thailand there is a long green eggplant that lends itself perfectly to this dish. When grilled it is succulent and absolutely delicious. We’ve never been able to find a long eggplant in the United States that roasts up as well. Occasionally we will even come across a long green eggplant from an Asian vendor at the Old Oakland Farmer’s Market but the flavor is just not the same. We found that Filipino long eggplants do work fairly well. 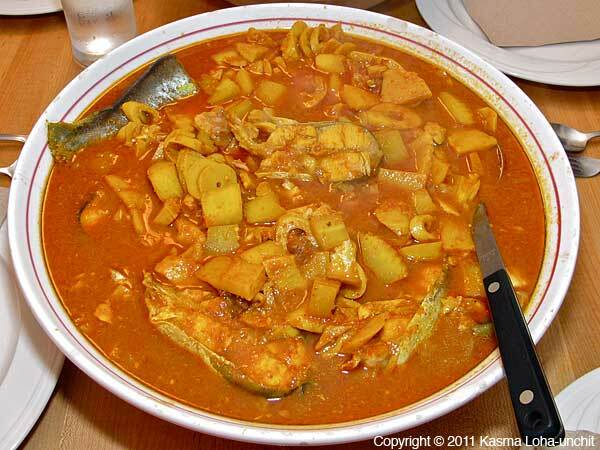 The last (but not least) of my five favorites is Kaeng Som (literally “Sour Curry”). Most people are familiar with the northern version of the dish: a tangy curry that gets its sourness from sour tamarind (makahm). I prefer the southern version – usually called Kaeng Lueang, or “Yellow Curry” to distinguish it from the better known northern version. The yellow color comes from turmeric, a common ingredient in southern dishes. There’s a good article in the Bangkok Post by Suthon Sukphisit on this curry that explains how the southern version is different: ‘Kaeng Som’ A thai culinary classic. The taste of southern kaeng som combines sourness, saltiness and spiciness, with no sweetness, and the chilli heat strongly dominant. Because of its heat it is eaten together with dishes that counter the spiciness, like sweet-salty shrimp or pork, fish fried with turmeric, bai lieng fried with egg or the fern-like phak kuud fried with coconut cream. This picture shows the version from Kasma’s cooking class, Advanced Set G. It’s a fiery dish that includes 30 dried red chillies, 5 large dried red chillies and 10 fresh red Thai chillies. She makes it with basa steaks, a good meaty fish. She includes sliced coconut or bamboo shoots, either of which give it a distinctive taste. It’s a dish that will have you reaching for a napkin (to wipe the sweat from your forehead) and for something to drink (to cool the heat in your mouth). We also get a very, very good version of this dish at Ruen Mai Restaurant in Krabi. Their version is probably hotter than Kasma’s. I can eat fairly hot after living with Kasma for over 2 decades, but a few bites of the Ruen Mai version (even with lots of rice) is enough for me. So these are five of my current favorite Thai dishes. Please leave a comment with your own favorites. 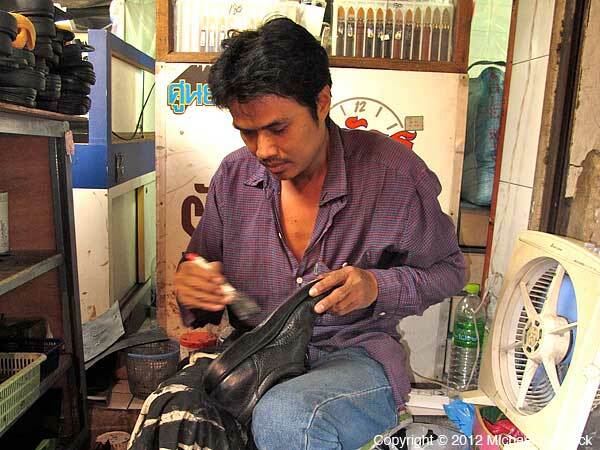 Often on the streets of larger Thai cities you’ll find seamstresses and cobblers set up right on the street. This blog looks one of each on the streets Samrong, part of Nakhon Thong in Samut Prakan, which is adjacent to Bangkok to the SE. These street stalls offer an inexpensive alternative for getting repairs made. For years I’ve been buying a rather expensive pair of very comfortable shoes that seemed to need replacing every 15 months or so; it is always the outside heel on each side that wears down. It was only two years ago that it occurred to me to try Thai street repair. Kasma owns a townhouse in the district of Nakhon Thong, which is right across a klong (canal) from Samrong Market located just off Sukhumvit Road a little ways past Soi Sukhumvit 113. 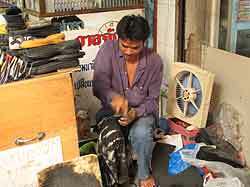 The street cobbler is found in between that Soi and Sukhumvit Soi 111; he sets up just under an overpass leading from his side of the street to the Imperial World shopping center. I took the shoes and showed them to him. I don’t speak enough Thai to explain what I wanted and didn’t really need to: it was obvious. He did not replace the whole sole; he added a new piece to even out the bottom of the shoe and then put a rubber sole replacement over the whole existing (and now evened out) sole. The cost? I remember 200 baht (less than $7.00). You can see on the left picture how the cobbler’s stand is nestled in on the street. The repair lasted half a year. The shoes cost roughly $180 and last about 15 months – so about $12 a month or $84 for 6 months. Extending the shoes for a half a year for $7.00 sure beats $84! Now every year I bring a pair or two of shoes to be repaired. 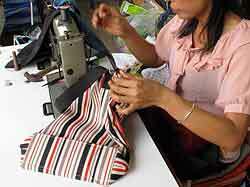 Seamstresses are another type of street repair that we take advantage of in Thailand. Each year we bring a few things that need repair such as a pair of jeans with a rip, a computer bag with a torn strap. This particular seamstress is found on Sukhumvit Soi 113 just on the edge of Samrong market. I usually drop my items off on the way to somewhere and then pick them up on the way back, usually a couple or more hours later. This last year I had her repair some moth holes in a sweater and replace a zipper on a bag. I’m usually embarrassed by how little she charges: 10 to 30 baht, usually. It hardly seems fair! Street seamstresses are easy to find – they just set up on the street. 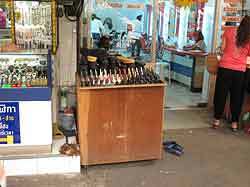 Here’s a blog on Samrong Market with some pictures. The market has two areas: the blue marker in the map shows the section near Imperial World Shopping Center. There’s also a large section on the other side of Sukuhmvit road directly by the canal (shown in blue). Another type of repair stall that you’ll find is watch repair. I’ve previously blogged on a watch repair stall on Sukhumvit Road near Soi 55 (Thong Lo) in Watch Repair – A Thai Option. The street watch repairman we use in Samrong is found on the street on the south-west side of Imperial World shopping center. Kasma has written a great blog about the community around her townhouse: Nakhon Thong – Portrait of a Thai Community. You are currently browsing the Thai Food and Travel Blog blog archives for October, 2012.